Hidden away in the mountains above the Sacred Valley until 1911, Machu Picchu is now a must-see for any visitor to Peru. The ancient city was built in the 15th century during the height of the Inca Empire. The site consists of nearly 200 structures (including homes, temples, agricultural terraces, ceremonial sites and palaces) built from huge stones fit together so perfectly that it is said even a blade of grass can't fit between two stones, an engineering feat for a civilization that lacked the use of mortar, iron tools or the wheel. The purpose of Machu Picchu is still unknown and there are many theories about what it was used for including a royal retreat for Inca elites, a strategic military holding, and a religious site due to its alignment with important geographic landmarks and astrological events. 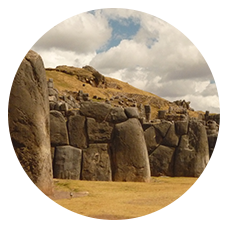 Located on the outskirts of Cusco, Sacsayhuaman is an ancient military stronghold of the Inca empire. The walls of the megalithic complex have the same characteristic perfect fit as the walls of Machu Picchu and were built leaning inward to withstand earthquakes. Considered one of the top treks in the world, adventurous travelers can follow the Inka Trail through the Andes all the way to the Sun Gate at Machu Picchu. This trail was constructed by the Inca for runners to deliver messages and supplies to the Inca rulers in the highlands and it passes by several ancient Inca sites along the way as well as a variety of climatic zones from Andean plains to alpine tundra and cloud forest. These puzzling geoglyphs located in the Nazca Desert and are thought to have been created between 400 and 600 A.D. by the Nazca culture. The mysterious lines and shapes take on the form of animals such as lizards, spiders, hummingbirds and monkeys as well as imaginary beings and geometric figures. Some archaeologists think the Nazca lines are astrological representations or religious sites. These rocky islands, sometimes called the Poor Man's Galapagos, are home to a large colony of sea lions, dolphins and over 150 species of sea birds including boobies, cormorants, Peruvian pelicans and Humboldt penguins. On the boat ride over be sure to look out for the Candelabro, a giant geoglyph etched into the sandy coastal hills. Though the high mountains of the Andes might be the first thing that comes to mind when thinking of Peru, the Peruvian Amazon actually comprises 60% of Peru and is the second largest portion of the Amazon after the Brazilian Amazon. This region is teeming with biodiversity and is home to huge numbers of mammals, birds, orchids and butterflies as well as several indigenous peoples occupying the lowland jungles of Peru. Holbrook Travel has a long history with the Galápagos Islands, our founder Giovanna Holbrook made her pioneering voyage there in 1971 and we've been bringing travelers to the incredible archipelago ever since. The volcanic islands were famously explored by Charles Darwin and the unique endemic species he found there helped to inspire his theory of evolution. When visiting the archipelago, which is a part of Ecuador, you'll have a chance to see animals that have no fear of humans including marine and land iguanas, fur seals, Blue-footed Boobies, Galápagos Penguins and Galápagos tortoises. Just as extraordinary are the landscapes and geography of the Galápagos which have shaped the species that inhabit the islands. Snorkeling is also spectacular in the Galápagos where you can swim with Green Sea Turtles, sea lions, rays, schools of fish and Hammerheads and even whale sharks. As one of the best-preserved historic centers in the Americas, Quito was a founding UNESCO World Heritage Site when the project started in 1978. 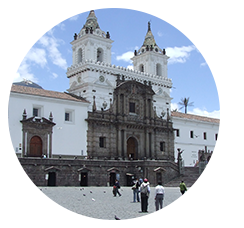 While in Quito be sure to explore the mix of Spanish, Italian and indigenous influence in Old Town's colonial architecture and plant your feet on the equator, located just outside of Quito. Guayaquil is Ecuador's bustling commercial center and most populous city. A stroll through the Malecón, the city's lively boardwalk along the Rio Guayas, gives travelers a taste of the local fare and Guayaquil's contemporary architecture. An explosion of colors will greet you as you make your way through Otavalo's open-air market. Check out the beautiful textiles and traditional dress of the indigenous Otavaleño merchants and brush up on your Spanish while interacting with the locals. We've put the Amazon on our must-see list not once, but twice. 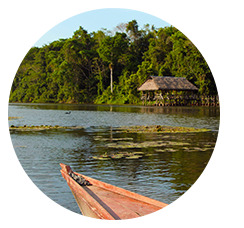 So what we're saying is if you have a chance to go see the Amazon region, GO!